Chalked 887 mL Ultra Matte Paint in Linen White Chalked Ultra Matte Paint creates a matte finish that dries to a velvety smooth finish. It transforms and rejuvenates furniture and home dicor, creating a unique one of a kind look. 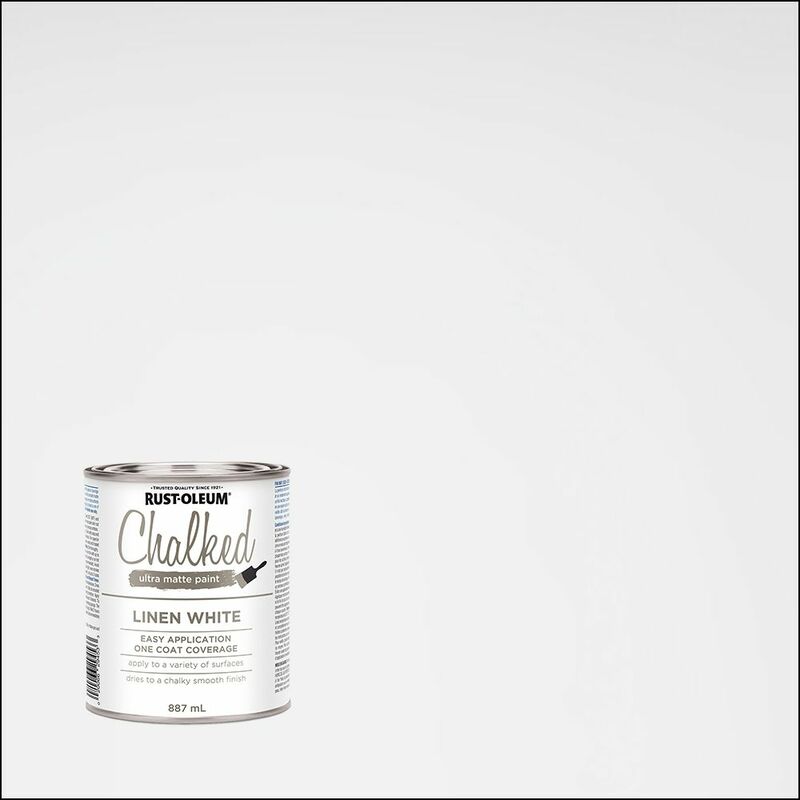 Chalked 887 mL Ultra Matte Paint in Linen White is rated 3.5 out of 5 by 4. Rated 5 out of 5 by Virgorian from Great chalk paint I bought this to repaint my desk and bed. So far I have only finished the desk. It’s great paint that dries fast and covers really well. As long as you go with the grain of the wood it has a pretty smooth finish. Also alittle paint goes along way so the price of it doesn’t seem so bad since it’s enough to finish a project or 2. Will definitely buy again. Rated 4 out of 5 by Simply Dani from Good Product I only use Rustoleum products to refinish furniture now. I use the Chalked products along with others. The paint is reasonably priced, however the white takes many coats to cover. I don’t have coverage problems with the other colours. I’d suggest using a primer with the white Chalked. Easy to distress for a vintage look. Rated 4 out of 5 by mccheri from great product I had no problems with the product. I think it works exactly how it is supposed to! you have to listen to the drying times and don't rush them. Have patients and your project will turn out great! Rated 1 out of 5 by Rainey from Disappointed I've used chalk paint before (Annie Sloan brand) and purchased this because of the price. After 4! coats I'm still not getting great coverage over a medium coloured wood. I'm really wishing I would have just spent the extra money and purchased the brand I know works great. Save yourself some frustration and pay the extra $20 for Annie Sloan chalk paint! I am applying the Kiltz primer over RV cabinets so that the paint will gripcan this be used over this product ?I know it says it can be used without any prep but the rv cabinets are shiny made of different product so i will be applying the primer first .